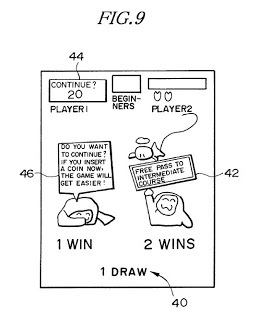 The ‘973 patent is designed to help insure a player’s cooperation and fulfillment of contracts in a video game. 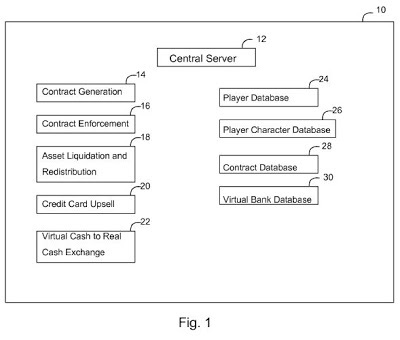 The invention allows a player to enter into virtual contracts in the game, contracts which are connected to a real-world bank account (through credit card information). Whenever a player defaults on a contract made in-game, he is fined in real-world money for the breaking of the contract. For all of you who get fed up with players quitting the game before a task is done, it seems this invention could be for you…if you’re willing to risk your money on your own virtual contracts. 1. A method performed by a computer, the method comprising: providing, by a Video Game Central Server, a virtual environment that is accessible to one or more players; receiving, by the Video Game Central Server, credit card information from a player; receiving, by the Video Game Central Server, a request to enter into a virtual contract from the player; wherein the virtual contract includes a condition that requires the player to engage in an action other than accessing the virtual environment; guaranteeing, by the Video Game Central Server, the player’s performance of the condition identified in the virtual contract with the financial instrument; penalizing, by the Video Game Central Server, the player if the condition is not met, by imposing a financial obligation on the credit card, where the condition is paying a periodic insurance premium for a virtual item; and maintaining, by the Video Game Central Server, the player’s credit history by maintaining records of the player’s contract obligations and rate of success in fulfilling the obligations. 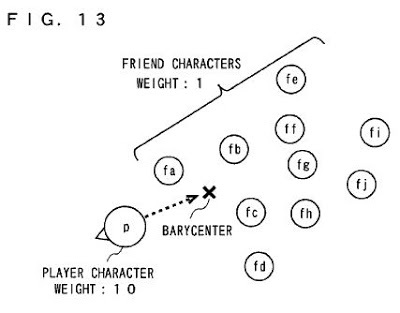 The ‘977 describes a feature for role-playing games whereby the main character is controlled by the user while a sub-character (computer controlled) follows behind him. The invention programs the sub-character so that he follows the path taken by the main character. Thus, the character automatically follows the user. This saves the user time by only having to move one character, not both. If the player gets too far ahead of the sub-character, the sub-character is programmed to take the shortest route to catch up to the user-controlled character. A movement determining map is stored in addition to a field display map. The field display map is a three-dimensional map for displaying a field of the video game on the image display screen. The movement determining map is a two-dimensional map in which an enterable region. An unenterable region is distinguishably provided for the characters existing in the field. A control section determines a movement route of the sub character, in which no unenterable region exists, using the movement determining map when a predetermined movement route determining condition is met. 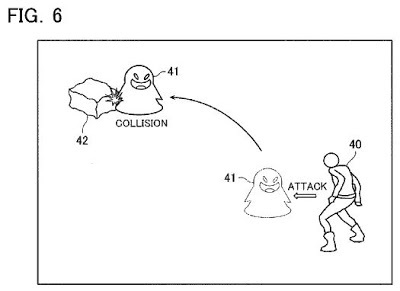 The sub character is caused to move in accordance with the determined movement route. The predetermined movement route determining condition is met every predetermined period of time or in the case where the main character moves apart from the sub character in a predetermined distance or more. 1. A video game processing apparatus that causes an image display apparatus to display multiple characters, including a main character and a sub character moving in a field that includes an enterable region and an unenterable region provided in a virtual three-dimensional space, on an image display screen of the image display apparatus, the video game processing apparatus controlling progress of the video game by controlling an action such as moving of the main character to be displayed on the image display screen in accordance with operations by a player and an action such as moving of the sub character following the moving of the main character to be displayed on the image display screen in accordance with a predetermined control program, the sub character moving so as to follow the main character, the video game processing apparatus comprising: a movement determining map generator that generates a movement determining mare based on a field display map, the field display mare being a three-dimensional mare that represents the field provided in the virtual three-dimensional space, the movement determining mare being a two-dimensional representation of the field display mare that identifies the enterable region and the unenterable region of the field; a movement determining map memory that stores the movement determining map in addition to the field display map; a movement route determiner that identifies the enterable region and the unenterable region on the field provided in the virtual three-dimensional space by using the movement determining map and that determines a movement route of the sub character in the field using the movement determining map when the main character separates from the sub character by a predetermined distance; and a movement executor that causes the sub character to move in accordance with the movement route determined by the movement route determiner, wherein the determined movement route of the sub character causes the sub character to follow the main character in the enterable region on the field, and wherein the determined movement route of the sub character exists only in the enterable region on the field. 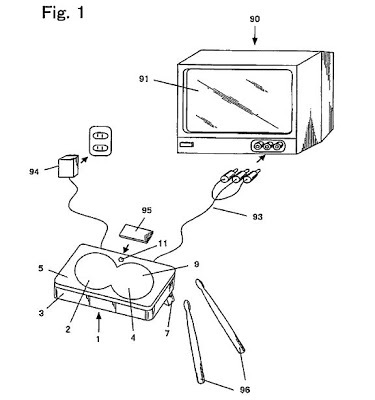 The ‘237 patent describes a music game console where the player strikes a surface in time with notes on the screen to produce musical sounds. The musical sounds change in the game depending on the timing of the player. 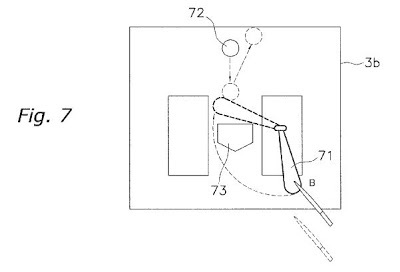 The pitch of the musical sound is controlled by the location of the player’s strike and the strength of the strike. Pitches are lowest at the bottom of the strike zone and are quieter when the player strikes the surface softly. Indication objects are displayed on a television monitor at the intervals in agreement with the rhythm of music, such that the player can generate musical tones in synchronization with music by striking the strike surface of a music game console in the appropriate timing as indicated by indication objects. In this case, the tone quality of the strike sound changes in the progress of music on the basis of strike sound indicating information. 1. A music game console comprising; a plurality of strike surfaces to be struck by a player; a plurality of detection circuits that correspond respectively to said strike surfaces; a plurality of vibration transmission plates that correspond respectively to said detection circuits; a plurality of resilient members that correspond respectively to said vibration transmission plates; and a support structure that supports said vibration transmission plates, wherein each of said vibration transmission plates is supported by said support structure through the corresponding resilient members, wherein said support structure is fixed inside of a housing such that each of said vibration transmission plates is located to face a rear surface of said corresponding strike surface, wherein said detection circuits are located to face said support structure, each of said detection circuits being attached to a corresponding one of said vibration transmission plates, wherein said vibration transmission plates are supported by said support structure so as not to contact with each other, wherein each of said detection circuits detects a striking strength and outputs strike information indicative of the striking strength, and wherein each of the resilient members comprises a rubber or a spring, wherein said support structure is provided with a plurality of holes that correspond respectively to said vibration transmission plates, wherein each of said vibration transmission plates is provided at a lower surface thereof with a guide, wherein each of said guides is inserted into a corresponding hole of said support structure though said corresponding resilient member, and wherein each of the guides does not contract an inner surface of the corresponding hole. 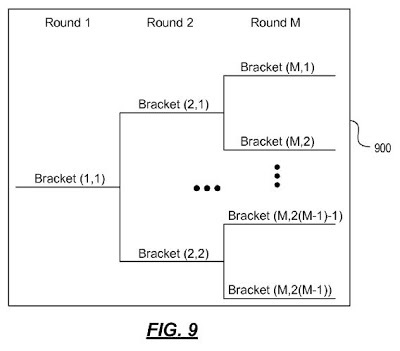 The ‘251 patent provides for a way to set up online tournaments in video games. The tournament is set up as a bracket (think March Madness-style) where the winners advance to play other winners. The system allows for players to join the tournament at any moment until the first game has started. Once the first round has begun, players are prevented from joining the game until the next tournament is established. Matched players may play their game any time they desire as long as their opponent is online and ready to compete. This system allows players to play their opponents as soon as both players have advanced to the next round. By giving players the freedom to play (and not having set match times), players can come and go as they please and set the game time for convenient moments. The invention here seems like it could be an enjoyable way to play tournaments. After all, who doesn’t love a good playoff (NCAA football committee excluded)? A multilevel online tournament is provided. The first tournament round has a single bracket and each subsequent tournament round has a winners bracket and a losers bracket corresponding to a bracket in the previous tournament round. The tournament format allows players to match-up against any other player located within the same bracket. The online tournament format also allows participants to start playing match in a round of the tournament prior to the official start of that round. Thus, players are able to more quickly advance through the tournament and spend less time waiting for a suitable opponent. The tournament format also allows for players to request available tournament byes and to automatically progress when they are unable to connect with other players due to quality of service issues. 1. One or more computer readable storage media storing computer readable instructions that, when executed, perform a method for progressing a plurality of participants through an online tournament when the plurality of participants cannot complete a match in a current tournament round, said method comprising: determining a number of slots N available in a next round winners bracket; assigning N participants to the winners bracket according to a trust rating; and assigning remaining participants to a next round losers bracket. 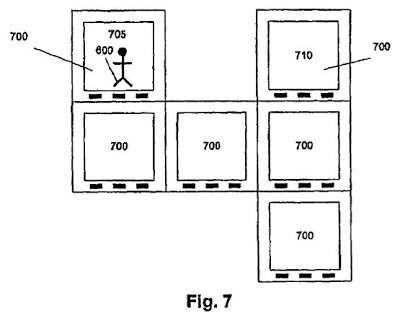 The ‘250 patent describes a 3Dhand-held game where the user can use a stylus to control his character and have the character perform gymnastic actions during gameplay. 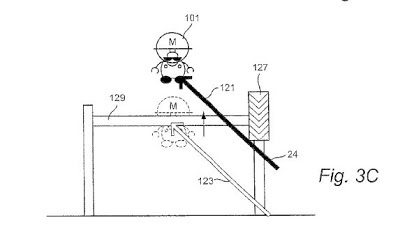 The invention allows a player to instruct his character to grab onto an elongated metal bar. Once the character is attached, the player may use the stylus to have his character perform gymnastic moves on the bar. These types of moves include handstands, spinning around the bar, and a variety of dismounts. A player may tap the screen while his character is spinning on the bar to activate a dismount sequence whereby the character lets go of the bar and flies in the air. The video or other computer graphics display shows, on a touch screen, a spinnable bar having a control wheel affixed to an end thereof. Strokes of a stylus applied to the surface of the wheel controls the direction and/or rate of spin of the wheel and bar. An animated game character holding on to the spinning bar may spin with the bar and perform acrobatic acts in response to other touch screen or other types of control inputs. 1. 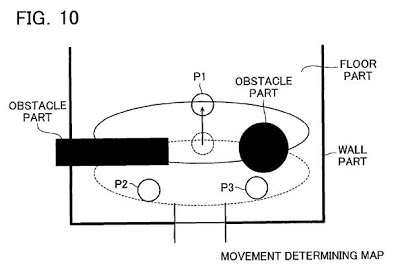 A method for modeling a gymnastic exercise comprising: displaying an animated game character holding on to an elongated object, the animated game character being moveable independently of said elongated object; detecting user manipulation of a control input device; determining, in response to said detected user manipulation, whether said user in manipulating said control input device has supplied a gesture simulating touch imparting a push to said elongated object; using animation to cause said displayed elongated object to appear to spin with an angular momentum so that repeated gestures simulating pushes in the direction of spin increase the apparent rate said virtual object spins; using animation to make the displayed elongated object appear to impart spin to said independently-movable animated game character so that said animated game character appears to spin with the spinning elongated object; and changing the rate of the spin of said elongated object in response at least in part to the detected control input. 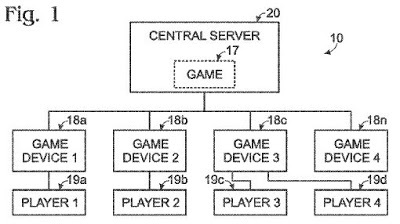 The ‘693 patent provides for a system which allows a host to select players during an online multiplayer game over a network. The host’s contact list has information of each player including their online status (whether they are online, idle, or offline). This allows the host to select available friends to invite to play the game. Once a player is invited to join a game with the host the two players enter into a chat session with each other. 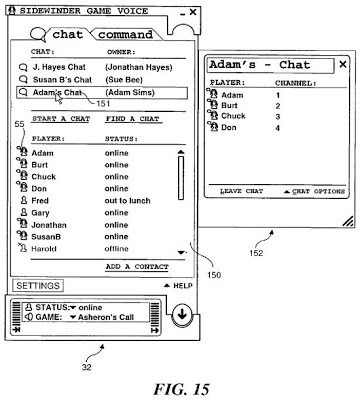 The chat session is independent of any game, so a player may enter the chat session without entering the actual game. Players communicate through either text messages or by microphone. Finally, the invention allows players who have entered the host’s game to invite other players who were not initially invited to play as well. This allows friends of other players (but not friends with the initial host) to have a chance of playing. 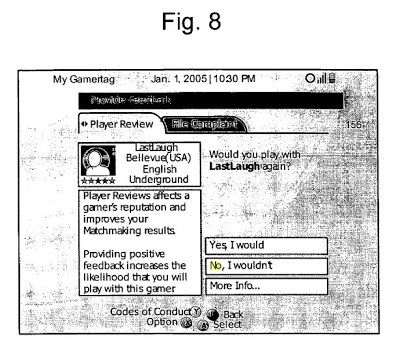 A method and system facilitating selection of participants in multiplayer online electronic games. The method provides an efficient procedure for players to host and join new instances of multiplayer online electronic games, as well as providing a scheme that enables players to join multiplayer online electronic games that are already in progress. The method is implemented through a gaming utility that runs on each player’s electronic device (e.g. PC) and interacts behind the scenes with an online messaging service. Player hosts are enabled to select players from a list of contacts provided by the online messaging service who they want to invite to join a chat session. A selected multiplayer online electronic game is selectively launched on all of the player’s computers through a single command issued by the host. Additionally, the gaming utility provides players with a list of existing chat sessions being hosted by other players so as to enable the players to join multiplayer online electronic games that are already in progress. The system includes a plurality of electronic devices linked in communication across a communications network, such as a LAN or the Internet. 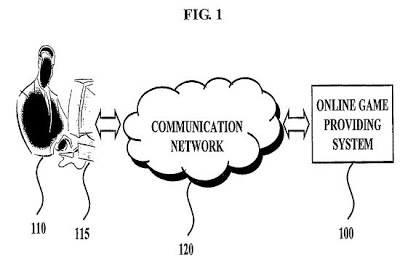 Each electronic device is operatively coupled to a headset having a pair of headphones and a microphone. The headset is worn by a player, enabling the players to verbally communicate with others in a verbal chat session. 1. 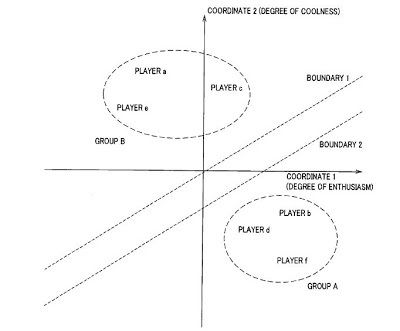 A system for enabling a host player to select one or more other players to participate in playing a multiplayer online electronic game played using a plurality of electronic devices linked in communication over a communications network, each of said plurality of electronic devices being operated by a different player and including: (a) a display on which a user interface is presented; (b) a memory in which a plurality of machine instructions are stored; and (c) a processor coupled to the memory for executing said plurality of machine instructions, said processor executing the machine instructions to implement a plurality of functions, including: (i) acquiring a contact list associated with the host player from an online messaging service along with the status of each contact, the contact list being associated with the online messaging service rather than any particular online electronic game; (ii) displaying the contact list along with an indication of each contact’s status, wherein the contact’s status indicates, for each contact, the contact’s status with regard to the communication network, the contact’s status with regard to the online messaging service, and whether the contact is utilizing the system enabling the contact to participate in playing the multiplayer online electronic game; (iii) enabling the host player to utilize the online messaging service to initiate a chat session using the online messaging service rather than any particular online electronic game; (iv) enabling the host player to select one or more players to invite to join the chat session including contacts from the contact list as well as players not associated with the online messaging service; (v) enabling any of the players who were invited by the host, to participate in the chat session, the chat session being independent from any particular game; (vi) providing the host player with a game selection menu thereby enabling the host player to selectively initiate launching an instance of a multiplayer online electronic game, the instance of the multiplayer online electronic game being separate from the chat session and the host player selecting the instance of the multiplayer online electronic game from a plurality of games displayed at the game selection menu; and (vii) automatically launching the multiplayer online electronic game on each electronic device being operated by each player participating in the chat session, the multiplayer online electronic game being launched in response to the host player selectively initiating launch of the instance of the multiplayer online electronic game, so that each player participating in the chat session automatically becomes a participant in the instance of the multiplayer online electronic game. 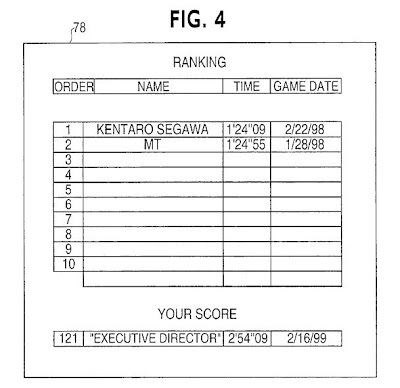 The ‘238 patent provides for an emotion controlled system which monitors the user’s physical parameters and changes the content of the games based on the information gathered. The game measures at least one of the following: heart rate, blood pressure, or temperature. The environment of the game changes depending on the level of interest and the emotional state of the user. The present invention relates to an emotion controlled system for processing multimedia data comprising a multimedia system for presenting multimedia content to a user an emotion model means for determining the emotional state of the user during the presentation of the multimedia content and an editing unit for changing said multimedia content in accordance with the emotional state of the user in order to present the changed multimedia content by the multimedia system.The present invention further relates to a method for executing the steps on this system. 1. 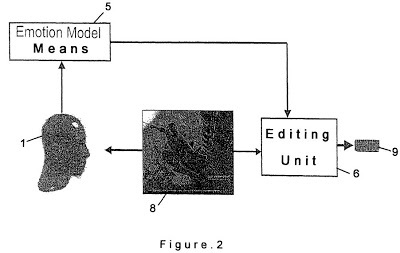 A method for an emotion controlled system for processing multimedia data, comprising: presenting multimedia content to a user using a multimedia system; determining physical parameters of the user during the presentation of the multimedia content using an acquisition unit, said physical parameters including at least one of heart rate, blood pressure, and temperature; changing the multimedia content relative the determined physical parameters using an editing unit, the changed multimedia content created in real time while the multimedia content is being presented; presenting the changed multimedia content using the multimedia system, said changed multimedia content having a transmission bandwidth different than a transmission bandwidth of the multimedia content, and the transmission bandwidth of the changed multimedia content depending on a level of interest of the user; and controlling an environmental device relative the determined physical parameters to intensify an emotional state of the user. Issued April 27, 2010, to Mattel, Inc. 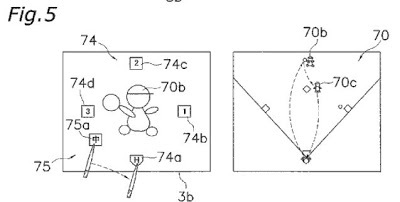 The ‘146 patent describes a hand held game much like the Tamagotchi toys that were popular over the past ten years. The system described here involves two systems which can be electrically connected to each other. The first character has different traits than the second one. The two characters have their own screens (operated by different players), but when the two systems are connected both characters appear and interact on the same screen. The present invention relates to a game, including a first module having a housing, a processor, a display operably coupled to the processor and an electrical contact positioned such that access is available to the electrical contact of the first module through the first module housing, and a second module having a housing, a processor, a display operably coupled to the processor and an electrical contact positioned such that access is available to the electrical contact of the second module through the second module housing, the electrical contact of the second module configured to contact the electrical contact of the first module, allowing the processor of the first module to communicate with the processor of the second module. Wherein when the processor of the second module is in communication with the processor of the first module, the first module display and the second module display are configured to each display a portion of a the game, each such portion configured to not overlap each other such portion. 1. A game, comprising: a first module having a first electrical contact, a first processor and a first display, the processor configured to display a first character on the display, the character having a first set of traits; and a second module having a second electrical contact, a second processor and a second display, the processor configured to display a second character on the display, the character having a second set of traits; wherein the first electrical contact and second electrical contact are configured to electrically couple in two or more interconnection configurations, each interconnection configuration allowing the first and second processors to communicate, wherein the processor is programmed to display a first animation sequence if the first module and the second module are arranged in a first interconnection configuration, and wherein the processor is programmed to display a second animation sequence if the module and the second module are arranged in a second interconnection configuration, the second interconnection configuration being different from the first interconnection configuration, the second animation sequence being different from the second animation sequence. 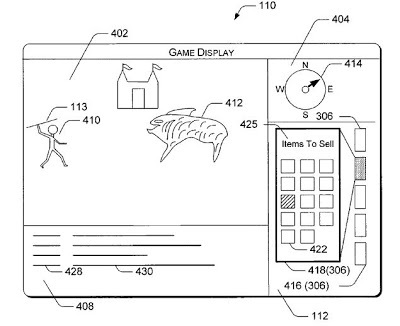 The ‘116 patent provides an inventory management system to manage the display of inventory items during a computer game. In many games, a player’s inventory is vital to his success or failure in a game. The method described here allows a player to have a limited number of items he has collected to be displayed and be easily accessible. The method also allows the player to categorize his inventory as he wants. The player also has the ability to use pre-set inventory categorizations (by the developer) if he would rather use those. Within a game, a filter is applied to a game inventory based on an attribute of each one of a plurality of virtual items. The filter can be player defined, game developer defined, system programmer defined, or a combination thereof. In certain versions, the virtual items that satisfy the query provided by the filter are displayed to the player. 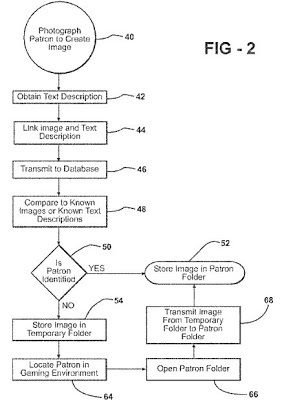 The player can thereupon access any one of the virtual items that are represented by the icons that satisfy the filtering query. In one version, the attributes of the virtual items can be changed using the filtering game inventory system. 1. A method comprising: operating, on a computing device comprising an electronic display, a computer game inventory management system to manage display of a game inventory of a plurality of virtual objects acquired during computer game play on the computing device as a function of computer-executable instructions that configure a processor to perform operations comprising: indicating to a game player, on the electronic display during computer game play, the plurality of computer generated virtual objects in a graphical scene describer of a game display, the graphical scene describer used to illustrate a computer generated representation of a player character that is interacting with one or more characters within a virtual world in the computer game play, the player character controlled by the game player, wherein the plurality of virtual objects are configured in the computer game play: to be obtained as possessions by the computer generated representation of the player character; and to comprise one or more attributes; collecting, in the graphical scene describer of the game display, the plurality of virtual objects using the computer generated representation of the player character; indicating, on the game display, at least a portion of the collected plurality of virtual objects as being possessed with the computer generated representation of the player character; displaying, on the game display, an inventory management describer in addition to the graphical scene describer of the game display, the inventory management describer comprising: one or more filter icons that represent one or more filters; and an inventory display that is used to display the filtered plurality of virtual objects; receiving, in the computer game play, an input via an input device from the game player, the input used to activate a filter of the one or more filters, the activation comprising selecting, in the inventory management describer, a filter icon that represents the filter; filtering, upon receiving the input from the game play to activate the filter, the collected plurality of virtual objects based on their respective attributes that are assigned during the computer game play, the filtering comprising filtering the collected plurality of virtual objects that match the filter that is activated by the game player; and displaying, upon activation of the filter, a filtered portion of the collected plurality of virtual objects in the inventory display, wherein each of the filtered portion of the plurality of virtual objects in the inventory display includes at least an attribute that matches the filter, and wherein display of the filtered portion of the plurality of virtual objects based on the filter activated by the game player facilitates the game player to determine which of the plurality of virtual objects to be disposed of or used in the computer game play as the computer generated representation of the player character interacts with the one or more characters in the virtual world in the graphical scene describer of the game display.